Redemption. 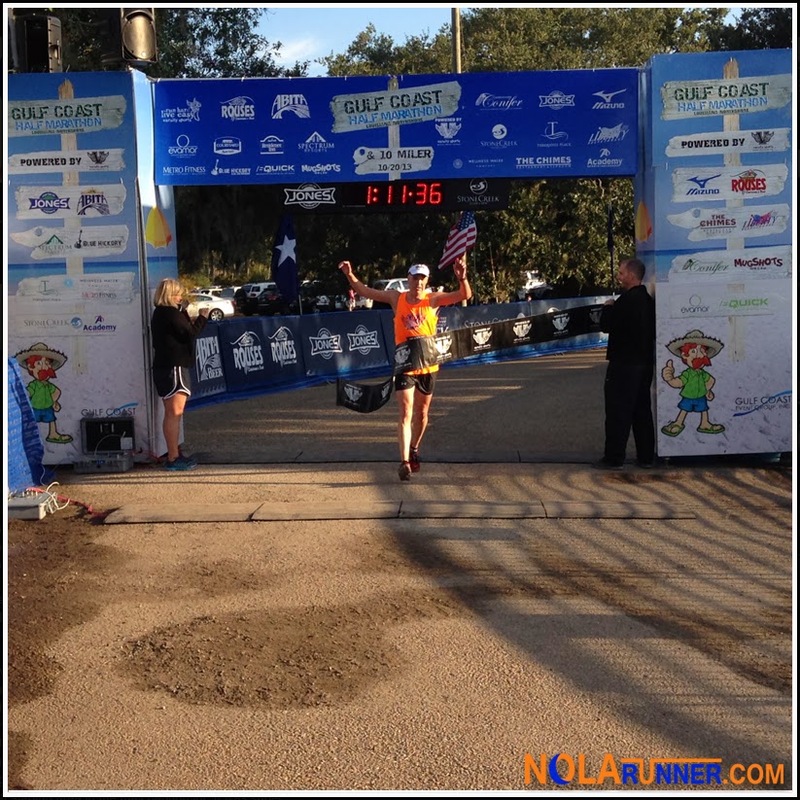 That's what I was seeking at Sunday morning's Gulf Coast Half Marathon. Cooler temperatures and a smooth course were going to give me opportunity to slash my time from the previous week's lackluster half marathon results; however, not knowing how my legs would hold up had me toeing the start line with minor trepidation. Anne participated in the Spartan Sprint race on Saturday morning (recap from that race later in the week), but was still up bright and early Sunday morning to go with my to my half marathon in Mandeville. A quick and easy drive across Lake Pontchartrain and the 26 mile Causeway Bridge had us at the race area in less than 45 minutes. The temperature was at least 20 degrees cooler than the weekend prior, and 80% less humidity. I was anxious, but ready to get the race underway. Sure enough, the start was on time at 7am and the field of roughly 1,000 runners took off. Having never run the course before caused some excitement, and I was looking forward to seeing another option for runs in the coming training months. Starting in Fontainebleau State Park was really interesting. It was still pretty dark at the start, as we ran out of the park and on to the highway. After about 2 miles running on asphalt, runners turned back north through a subdivision bordering the lake. I noticed in this initial segment of the course that water stations were very plentiful, with three being within a two mile span. After previous years of warm weather, organizers were prepared for any conditions mother nature threw at them. Kudos to them for adapting to the fickleness of the South Louisiana forecasts. The race took advantage of several miles along the shores of Lake Pontchartain, with great views of the oak trees draped in Spanish Moss and the wide open water dotted with sailboats. There were patches of spectators cheering for runners on this stretch, but they were few and far between. The course wound back in to the neighborhood with several twists and turns that showed off some spectacular north shore residences, and then headed back to the park down the St. Tammany Trace. The trace is a scenic asphalt bike / jogging path lined with trees that provided great shade to participants. The course from the 4th mile marker on was really pretty. I enjoyed the escape from busy streets and commercial areas that the route provided. I was lucky run in to a friend who volunteers with Team In Training. He was coaching participants who had fundraised for their charity using the Gulf Coast Half Marathon as their final race. He ran with me for half mile stretches a couple times during the race, and was a great distraction who helped make the miles fly by. Before I knew it, the race was coming to an end. Aside from some chafing issues that arose in the final miles, I felt great for the entire event. I shaved about 21 minutes off my time from the previous week's race, but still didn't get back under my 2-hour goal. That's perfectly fine with me since I felt great, and I have a time to work toward for my next race. Anne was waiting at the finish line as soon as I crossed. In the weeks prior to the event, a 10-Mile option was announced, so she had already snapped photos of the male and female winners of both that race and the half marathon. The camera was locked and loaded for when I crossed the line as well. Once I grabbed a water and my multi-purpose medal, she walked around with me to let me stretch my legs, grab some food and enjoy an Abita Satsuma ale. We checked out the multiple races that were setup to take registrations for their future events, and I informed her which ones we would be running. A live band was performing, and runners were enjoying the beautiful weather in the amazing park that looked completely different in the sunlight. Having already had a long weekend, we wasted no time in getting back to New Orleans. I was ready for pancakes and a nap, and when it gets to that point, there's no denying me carbs and sleep. 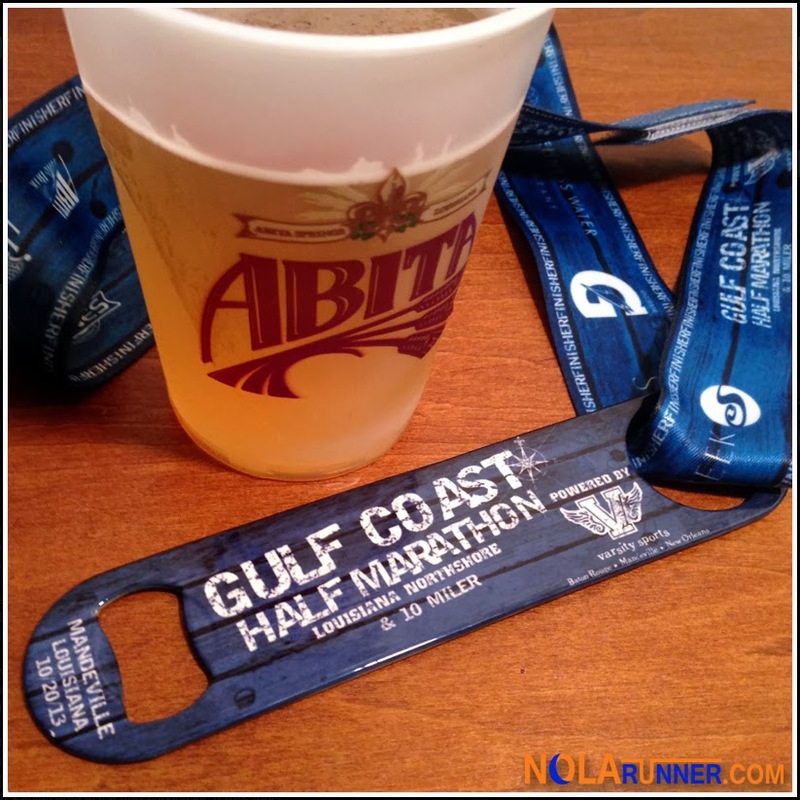 I was relaxed now that the Gulf Coast Half Marathon was behind me, and was impressed by how well executed and organized it turned out to be. Should the race schedule allow in future years, it's definitely one to regularly add to the calendar. 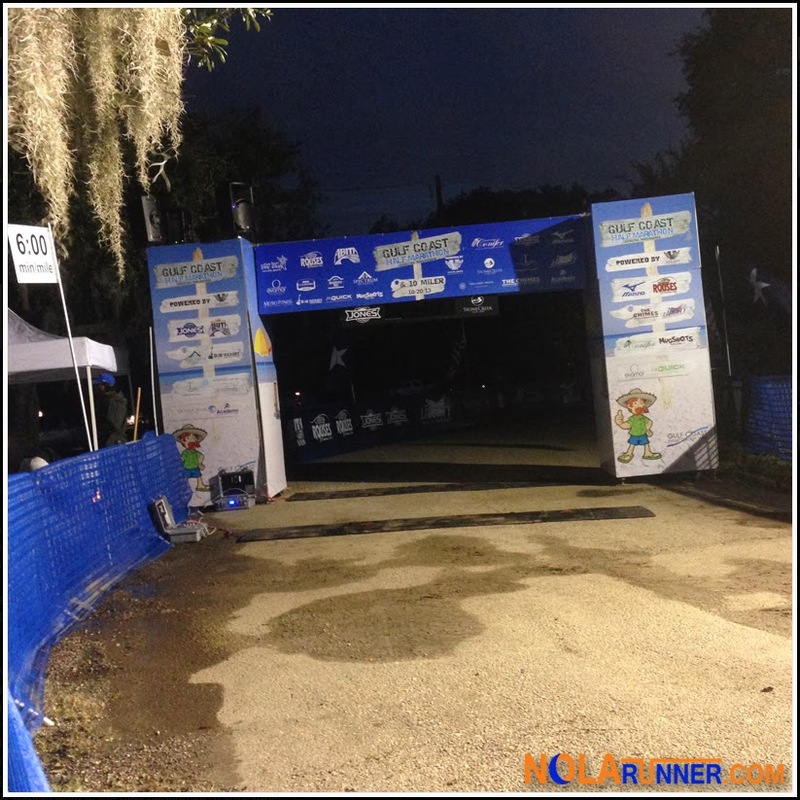 Check out more photos from the finish line by clicking over and hitting LIKE on the NOLArunner Facebook page HERE!